PUMA CATch up>>SPORTSTYLE>>Welcome the Minions to the PUMA Family! Just in time for their next onscreen adventure in “Despicable Me 3”, the Minions bring their subversive sweetness to PUMA. 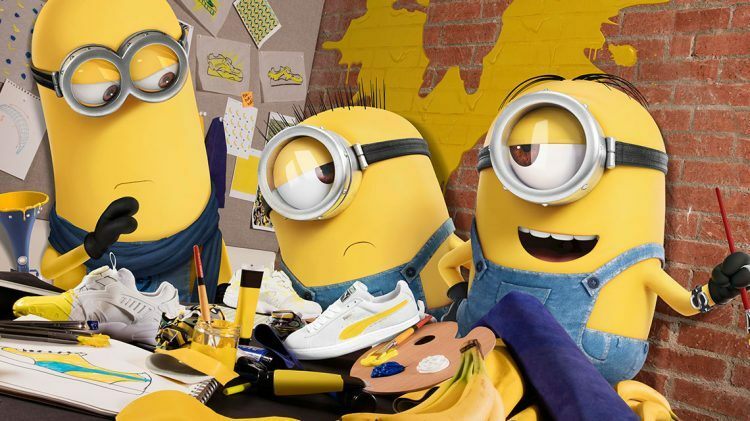 Together with Illumination and Universal Brand Development, PUMA has signed the multi-season partnership with the mischievous Minions from the blockbuster “Despicable Me” franchise. Manuel Torres Port, Executive Vice President of Universal Brand Development, called the collaboration with the Minions a natural fit for PUMA. “The Minions are global pop icons who are just as fashionable as they are timeless,” he added. The Minions Stuart, Carl and Kevin rendered their playful yet fashionably luxe designs on PUMA’s sports-inspired styles. Our classic silhouettes, like the PUMA Suede, get a fresh makeover in premium tonal black upper with custom Minions-painted graphic insoles. “PUMA has a long-established reputation as a leading creative force in footwear design”, says Torres Port. Now, the Minions have created new patterns and added splashes of colour, plenty of goggles, and much more.